In contrast to many other nations, the social work profession in India has not developed formal, indigenous ethical standards or a rich body of scholarship on professional ethics, although there are a few nascent and noteworthy efforts, particularly by the Tata Institute of Social Sciences, Bombay Association of Trained Social Workers, and several individual scholars and practitioners (notably Gracy Fernandes, Indrajit Goswami, and Josantony Joseph). That said, Indian culture is rooted in ethics and values that influence social work practice. Core ethics concepts are embedded in Ṛgveda, one of the oldest texts not only of India but also of the entire world. In Ṛgveda, one finds discussion of the idea of a cosmic order, ṛta, which represents harmony and balance in nature and in human society. Social work in India has also been influenced directly by the culture's embrace of core values related to the Bhakti movement's value of humanism and individual worth and dignity; Sarvodaya, which emphasizes the values of equity, justice, and empowerment of the community as a whole; and the spirit of Swaraj, which promotes self-governance. These too are values that resonate with traditional social work values. Indian social work values are replete with influences from the Vedic period, Hinduism, Buddhism, and Jainism. During my work in India I participated in many discussions about traditional social work values and ethical principles related to confidentiality, boundaries, dual relationships, self-determination, paternalism, informed consent, distributive justice, whistleblowing, and compliance with laws and regulations. During one conversation, I spoke with an Indian social worker about how, in a nation with a population of more than 1.2 billion, it can be extraordinarily difficult to protect clients' privacy; services are often provided in stunningly crowded and chaotic settings. One of the most enduring themes in my discussions concerned Indian social workers' principal focus on clients' most basic needs: food, clothing, shelter, and hygiene. Some estimates indicate 30% of the Indian population lives in poverty; this is nearly double the poverty rate in the United States. In further contrast to the United States, where a significant percentage of social workers pursue clinical careers to provide counseling and psychotherapy, social workers in India focus particularly on issues of human survival and basic sustenance. Also, India is a much more collectivist culture than is the United States, which is much more individualistic; one practical consequence, I was told by many Indian social workers, is that their ethical decisions are often driven by what is considered best for the family or community. 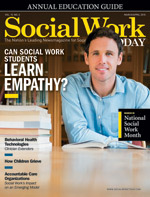 I heard story after story about how social workers in India filter many ethical decisions (e.g., about whether to treat clients paternalistically or share sensitive information about a client with his or her family members) through a cultural lens, which often places family and community interests above individual interests.